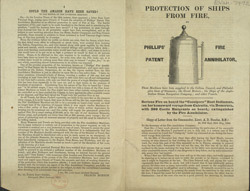 The Phillips fire annihilator advertised here was an early type of high-pressure fire extinguisher. This leaflet is especially at pains to stress the importance of fire safety aboard ships and to this extent mentions disasters at sea on several occasions. Mr Francis Morton in particular - a self confessed sales agent for the Phillips company - dilates on the disaster that struck the English steamer, 'Amazon', in 1851. Morton's claims that the Amazon could have been saved by fire extinguishers seem a little farfetched. Her captain died only 24 hours after leaving port; she suffered two collisions soon after and was run aground - before a fire even started. While the Amazon was recovered and towed eventually back to port, her luck did not change. She was bought by an American industrialist at auction and saled from Nova Scotia in 1872 under a different name - the Marie Celeste. This incarnation of the Amazon lost its way on a journey to deliver alcohol to Genoa, Italy. It was discovered, drifting and derelict, off Gibraltar the following year. There were no signs of struggle aboard and yet the entire crew had disappeared, never to be seen again.